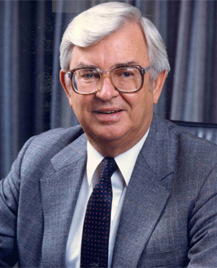 George W. Kochheiser passed away on Wednesday June 17, 2015 in Cincinnati, Ohio. He was predeceased by his wife of 66 years, Kathleen. He is survived by son, Kent and daughter-in-law Beth, also of Cincinnati, and sister Jeanne Faust of Newton, IA. He was born on October 11, 1925 in Lorimor, Iowa to George and Dorothy Kochheiser. He graduated from North High School in Des Moines in 1943. He served in the US Army in World War II in both the European and Pacific theaters with the 341st Infantry Regiment, 86th Division and was awarded the Bronze Star and Purple Heart. Upon discharge from the Army he enrolled at Drake University. Following graduation Mr. Kochheiser began his 41-year career with EMC Insurance, beginning as a clerk in the file room and retiring in 1991 as President and Chief Operating Officer. He continued serving on the board of directors until 2008. Mr. Kochheiser achieved the CPCU designation and focused much of his work on promoting advanced insurance education within the company. In May of 2009 he was inducted into the Iowa Insurance Hall of Fame in recognition of his many contributions to the business of insurance. Click here for Mr. Kochheiser’s profile page from his 2009 induction into the Iowa Insurance Hall of Fame. Click here for Mr. Kochheiser’s obituary as published in the Des Moines Register on June 21, 2015.